It’s FINALLY that time of year! Spring is upon us (though Winter is doing a good job of sticking around), and BEA is just around the corner. 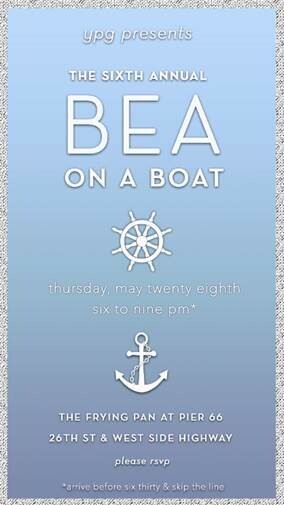 So join us at the Frying Pan for YPG’s 6th Annual BEA on a Boat party, taking place this year from 6:00-8:00pm on Thursday, May 28th. Celebrate all the free galleys and promotional tote bags you’ve managed to snag, and rest your feet after spending hours running around the Javits Center. In case you’ve never been, Frying Pan has gorgeous views of the Hudson River and a stellar bar.